Numeris released its quarterly ratings for the Montreal market last week, covering the period of Feb. 26 to May 27. There isn’t much new among the anglophone or francophone markets in terms of market share, but the numbers give us another data point to look at some longer-term trends. It shouldn’t come as big a surprise as some are making it, but ICI Radio-Canada Première is the top-rated station in Quebec City, both in terms of listening market share (above) and total listeners in the central market, according to data released by Numeris on Thursday. Three talk radio stations — RadCan, Cogeco’s FM93 and RNC Media’s CHOI Radio X — have been battling for top spot for the past few years, and FM93 has come out on top recently. But in this ratings period (measured Feb. 26 to April 22), it suddenly drops to third. RadCan, meanwhile, climbs to first while CHOI remains mostly stable. Compared to the spring, FM93 and Radio-Canada have lost some ground and CHOI has regained it to climb into second place overall. There was some shifting of the order, but the biggest change was to RNC Media’s Pop 100.9, which doubled its share. The last ratings period came just after they switched from rock to pop, which caused a dramatic decrease in ratings. Now they’re better than the 4.8% share they had a year ago as a rock station. More coverage from the Journal de Québec and Le Soleil. Among the details noted, CHOI continues to do better in the suburbs while FM93 reigns in the central market, Jeff Fillion has the highest-rated noon show, and FM93’s move to all-talk weekends has had a negative impact on their ratings. Bell continues to dominate this market with its 40% share, double that of Cogeco, but Radio-Canada’s main network saw a bump. Another Bell-dominated market. But the story here is CKBN-FM (FM 90,5), a community station on the south shore covering the Bécancour region, which has climbed above Cogeco talk station 106,9 to claim fifth place in the market. Radio X is no longer king in blueberry country as Bell’s Rouge FM takes the lead. Énergie is also up, pushing Bell’s share from 38.5% to 42.1% since the spring. The only two stations reporting in this market are both owned by Bell Media, so there isn’t much competition to talk about. But Rouge FM has pulled well ahead of Énergie after being a couple of points behind. With more than 20 stations in the region, only CBC cracks the 10% share in English. Newcap’s Hot 89.9 leads the music stations and CFRA leads the commercial talk stations, but beyond that it’s a very tight battle. Torres Media, which owns CIDG-FM, sent me (unsolicited) some numbers showing the station’s growth since it changed frequency from 101.9 to 101.7 and increased power. An 82% increase in the adults 25-54 audience is impressive. But the station still has only a 2.9% share overall. At least the top five stations are all French-language ones among francophones. But RNC’s one-syllable pop music stations are down with the top-rated English music stations. In Sydney, N.S., community station The Coast 89.7, licensed to Glace Bay, has been added, and reports a 13% share, good for fifth place out of eight stations (six plus CBC). In London, Ont., CKOT-FM (Easy 101), which was purchased by Rogers a year ago, has started reporting ratings even though it’s licensed to Tillsonburg, 40km away. 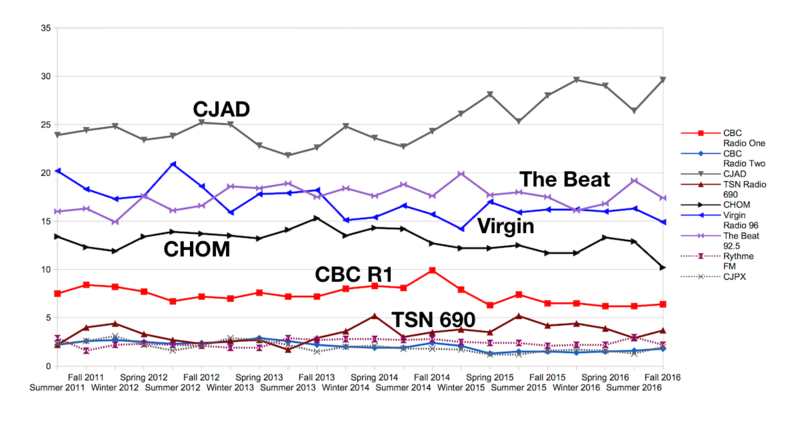 Numeris shows it’s the top-rated private station in the market, behind only CBC. In the spring it was behind Bell’s country station BX93 and Virgin Radio. In Hamilton, CHTG-FM (92.9 The Grand) in Haldimand has begun reporting in that market after being bought by Durham Radio and switching from country to classic hits. It scores only a 1.2% share as a spill station. In St. Catharines/Niagara, CIXL-FM (Giant FM) has taken the lead from Bell’s EZ Rock, gaining five share points in a year while EZ lost four. Bell’s 97.7 HTZ also saw a bump from 5.6% to 8.0% in a year, but we’ll see if that survives the recent layoffs at the station. In Sudbury, Ont., which last year had four stations within 1.3 share points of the lead, KICX Country has climbed on top with a 20% share while the others fell below 15%. KICX is in the process of being purchased by Bell. Rogers’s 92.7 Rock jumped from sixth place to third by increasing its share by more than 50%. The market has six stations with shares above 10%. In Winnipeg, Corus’s rebranding of Fresh Radio as Peggy 99.1 has had only a modest effect on ratings, going from 1.6% to 2.1%. ChrisD.ca and the Winnipeg Free Press have more analysis of Winnipeg ratings. In Prince George, B.C., Vista’s CIRX-FM (The Goat) has climbed into a commanding lead with a 25% market share compared to second place with 19.7% a year ago. All five stations have at least a 14% share. Castanet has details on ratings in Kelowna, B.C. Total audience listening share percentage among anglophones in Montreal, from Numeris top-line ratings. Numeris has released the summer ratings for Montreal radio stations, and though there isn’t much new here, it’s more good news for The Beat 92.5. Its 21.1% share of tuning hours among anglophones is the best it’s gotten since the station launched out of the ashes of The Q in 2011. The new report widens the lead it had over direct competitor Virgin Radio 96, which appeared to narrow slightly in the spring. As the chart above shows, Virgin hasn’t been ahead of The Beat in this category by any significant margin since 2012. For much of that time, Virgin did claim the lead among the adults 25-54 and women 25-54 demographics that appeal to advertisers. But The Beat has since won in those categories, too. Steve Kowch has some numbers compiled from Bell Media that show The Beat winning in every demographic. Of course, The Beat can’t claim to be Montreal’s most popular radio station (that would be 98,5 fm), its most popular station among anglophones (that would be CJAD, though its lead has dropped off significantly), or its most popular music station (that would be Rythme FM). Bell Media did something similar on the French side, claiming Rouge FM 107,3 is the most improved radio station over the summer. But among all francophones, Cogeco’s Rythme has 50% more listening hours. Like Virgin, CHOM is also experiencing a long-term downward trend from its high in 2013. In commentary online, it seems the station anglos want to talk about is TSN 690, predicting doom over a drop from the spring as well as last summer that is certainly rock-solid evidence that the on-air personality they don’t like is awful and should be fired. I don’t know why the ratings are down (though the P.K. Subban trade probably had people tuning in last summer), but the station’s ratings fluctuations don’t seem out of the ordinary for me. As usual, take these numbers with a grain of salt. Summer is different from the other quarters, there’s less news and no Canadiens games, so CJAD, CBC Radio One and TSN 690 usually dip while the music stations peak. Among francophones, talk radio actually did better during the summer, with 98,5fm still ahead at an 18.6% overall share, followed by Rythme FM (13.6%), ICI Première (12.7%), CKOI (10.4%), Rouge (8.8%), The Beat (6.3%) and Énergie (5.8%). The new kids on the Numeris block, CHRF 980 and CIBL 101.5, are about the same, with 900 and 100 average listeners a minute, respectively. 91,9 Sports had a 2.3% overall share among francophones, its best result since launching that format, putting it just behind ICI Musique and Radio Classique in terms of listeners. There are a couple of stories that can come out of the Quebec City page of the latest Numeris radio diary report released Thursday: One, that CHOI Radio X is no longer the powerhouse it once was (in large part because other stations in the market have copied its populist talk format), and two, that despite the “radio poubelle” reputation of the city’s stations, Radio-Canada’s ICI Première station is doing quite well. As you can see, ICI Première is in a statistical tie with FM93 in terms of audience in all age groups (among advertiser-friendly demographics it’s another matter). Radio X is in third place, followed by the two Bell Media stations, and the two Leclerc Communication stations behind that. CHXX’s change from rock-based Radio X2 to pop-based Pop has resulted in a drop in market share, but the company is optimistic it can rebound. Le Journal de Québec breaks down the ratings for specific shows in various time slots. Le Soleil gets reaction from Radio X, which notes it does well among 25-54s, though some of their on-air personalities aren’t so diplomatic, taking shots at the competition. Le Journal also notes that a host at Énergie wants Gilles Parent of FM93 to give him his house as promised, and Parent in turn took a swipe at BLVD’s Nathalie Normandeau. Other on-air statements are compiled here. Bell owns the Sherbrooke market pretty well, with the top two stations representing more than 40% listening share. Cogeco’s two stations combined have half that. 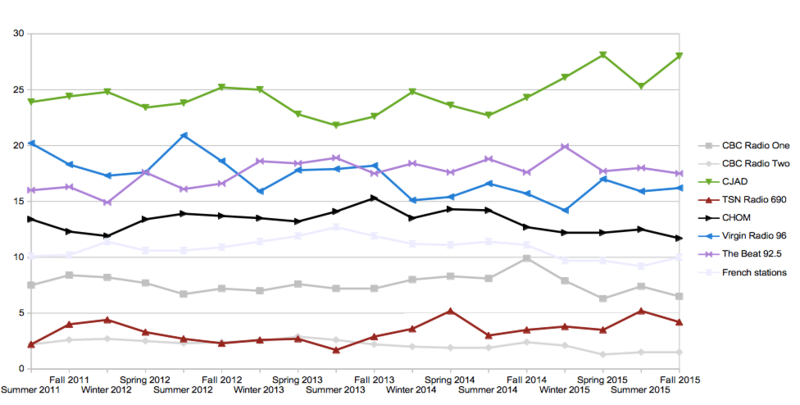 La Tribune notes there’s a decrease in overall listening over last year. Bell also tops in Trois-Rivières, though the lead is not as large. Radio X regains the lead in the heartland, after being in third a year ago. The Bell stations are also doing well there. Little change here over last year: Bell also has the two top private stations for francophone listeners in the national capital, while RNC Media’s new single-syllable music stations are more than a point behind the anglophone music station. (I’ve left out the remaining anglo stations.) Nevertheless, Le Droit notes that CFTX-FM’s change from Capitale Rock to Pop has meant a huge increase in ratings, from a 0.5% market share in September.